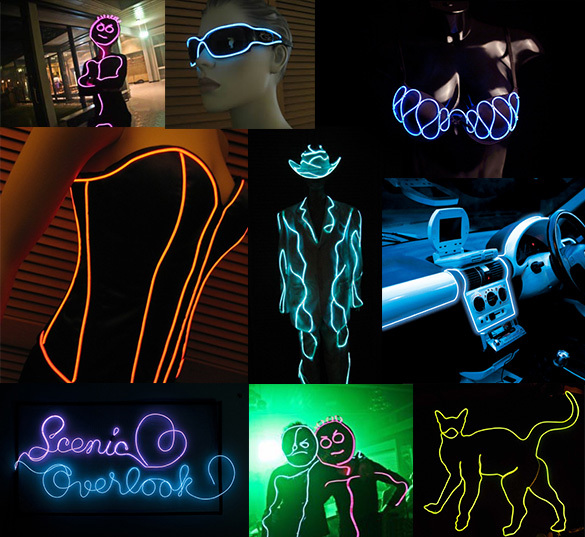 Take your EL wire project to the next level, thanks to these cool EL wire accessories. Need to hide you power pack or simple start your EL wire further from your power supply? The EL wire 1m extension is the gadget you need. Easy to use, thanks to its quick connectors, you can install it in seconds. Please note that this extension is only to be used between your power supply and your EL wire, it cannot be used at the end of an EL wire to extend your circuit as the EL wire does not have a connexion on both ends. The EL wire splitters are ideal if you wish to connect to 2 or 3 EL wires on the same power supply. Like the extension, the splitters are only to be used between the power supply and the EL wire as there is no connection at the end of the wire to expand it. In order to obtain a set up that is as bright as possible, we do not recommend using the three way splitter if your EL wire is powered with the battery pack. Bring EL wire accents to your automotive project with the EL wire AC inverter. The AC inverter connects to the 12V DC circuit or your car, motorcycle, boat or RV on one end and directly into the EL wire on the other. The inverter is fully compatible with the extension and splitters and features the same quick connectors for easy hook up. Ordering the accessories you require is easy; simply make your choice in the drop down menu! *Note that the battery packs don't include the batteries. Complete discounted EL wire kits can be ordered here.